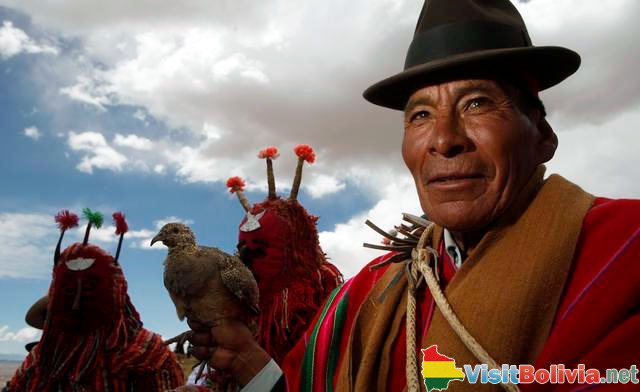 The Aymara is a native ethnic group with an estimated population of 2,000,000 in Bolivia alone. They have lived in the Andes region which covers Western Bolivia, Southern Peru and Northern Chile. The Aymara is an ancient people in the city of Tiahuanaco which used to be the capital of a great empire in Central America. In the reign of Huayna Capac, the Incas conquered the region which the Aymara inhabited. Once the Spanish arrived, the Aymara has become a colonized tribe and were divided upon different chieftainties - the Charqa, Quillaca, Carangas, Haracapi to name a few. Although subjugated by the Incas and colonized by the Spaniards, the Aymara continues to dominate the region until the present day, living mostly in the Lake Titicaca basin. The present urban center of the Aymara region is the El Alto (population 750,000) near the Bolivia capital of La Paz. The Aymara language is still spoken largely in Peru and Bolivia, around the Titicaca region and is considered a separate unit. It has its own flag known as the “Wiphala” which is made up of seven colours quilted together with diagonal stripes. The Aymara people grow and chew coca plants for centuries, using the leaves for traditional medicine as well as a ritual offering to the sun god Inti and the earth goddess Pachamama. 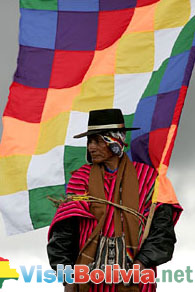 A cultural icon synonymous to Bolivia, the Chola dress (bowler hat, aguayo, heavy pollera, skirt, boots and chunky jewelry) is in fact an ethnic symbol for the Aymara women.